It was a shock to see how much it had changed. 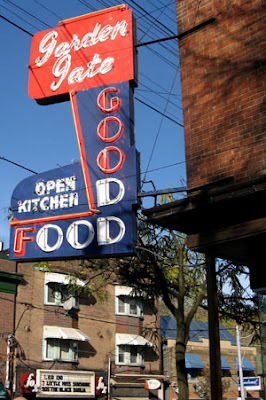 The last time I was at The Goof (Aka The Garden Gate Restaurant) was when I was in my early twenties. At the time it was grungy but weirdly charming. There were high booths, individual jute boxes and if memory serves me correctly a lot of dark paneling. Now it is light, funky, open and airy with a few pictures on the walls of what it once looked like. The menu today contains the history of how it opened for business in the early fifties. The goofy nick name comes from a light malfunction on the sign which caused the letters to read GOOD FOO and locals thought it would be funny to affectionately refer to it as THE GOOF. What has not changed after all those years is the menu. It still offers a bit of everything at a good price. Last night we took the kids for an early New Year`s Eve dinner. I had such a yummy meal. Fillet of soul, mash potatoes, veggies, cranberry juice and red jello. Comfort food for the last night of 2010. What sent me down memory lane was a table full of young teens who were joking with the waiter and enjoying an early start to their night. It made me remember times that I had done the same when I came to visit my cousins who lived in the Beach (I lived in Mississauga at the time). We often landed there and I remember giggles and plates of chicken fried rice. ( I could afford only that). So when I left The Goof last night and headed to my cousin`s place for New Year`s Eve Celebrations I could not help but laugh when Jason, now in his thirties talked about his memories of late nights at The Goof where after parties he and his cheap teenage friends would order egg rolls and water right when the restaurant was trying to close up. So if you have a special memory from THE GOOF - please feel free to share it here in the comments. Hopefully The GOOF will leave you feeling giggly.